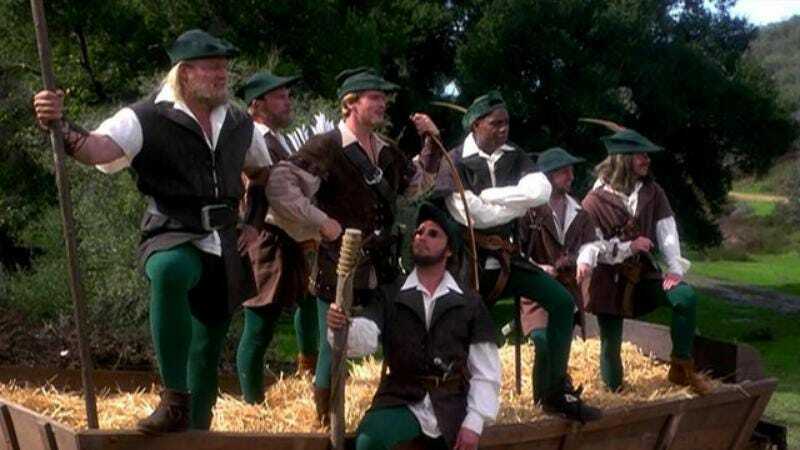 It feels like only yesterday (because it was) that this whole Robin Hood thing was spinning out of control, the four separate movies about Sherwood forest’s favorite public domain intellectual property on their way to creating a singularity that will overtake us all. Today comes evidence that the singularity has begun, as a future consisting solely of Maid Marians and wealth redistribution streaks across the television spectrum. Deadline reports that a Robin Hood television series is in development, based on the outlaw archer during the reigns of Richard The Lionheart and King John. British author Angus Donald’s book series The Outlaw Chronicles is the source material for this newest addition to the burgeoning swell of Hood-themed projects that will slowly transform all into Little Johns and Friar Tucks. Michael Konyves, co-writer of the upcoming Clive Owen starrer Last Knights, has been hired to write the adaptation. The story follows Robin Hood’s exploits, as his mission “turns from trying to raise money for his pardon to something much greater,” which is probably securing merchandising rights for various collectibles. “He must confront the demons of his past, as well as protect those he most loves, including Marie-Anne, Countess of Locksley, the love of his life,” Deadline says. There are six books in the series, so the TV show will have plenty of source material. No word yet on which network will pick up the show, but given that they already tried a couple years ago with Sherwood, this has The CW written all over it. Thus, it’s probably only a matter of days until ABC, FOX, TruTV, and the Home & Garden network all announce their respective Robin Hood shows for this fall.